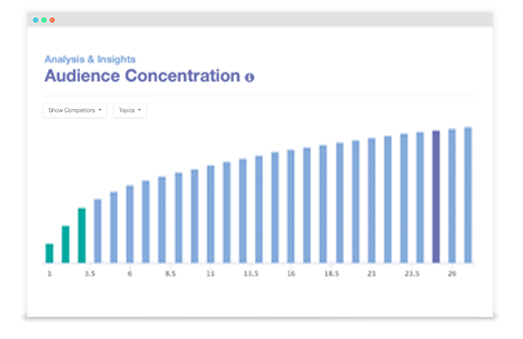 VideoAmigo’s Audience Concentration shows you whether or not too many of your views are coming from too small a small number of videos. The most successful YouTube channels – the ones that are most sponsorable – have views that are spread out relatively evenly across the content library. 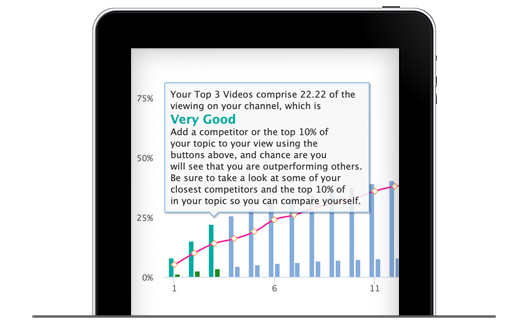 VideoAmigo shows you your curve, explains what it means, and lets you plot key competitors and the Top 10% in your Topic. You’ll learn how to get a truly great story! YouTube channels can be one-hit wonders, too. Just like bands (or, two-hit or three-hit wonders). You wouldn’t buy the whole album of a one-hit wonder band, and you won’t subscribe to a one-hit wonder YouTube channel even if you love that great video they once made. 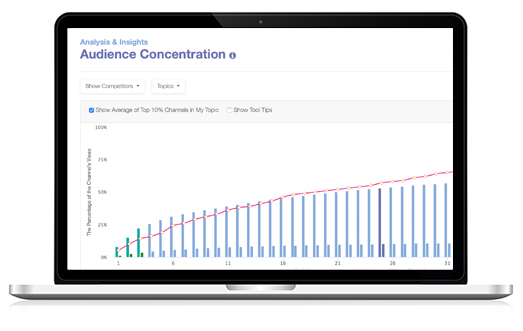 That’s the idea behind our Audience Concentration Analysis. How close to being a one-hit wonder are you? To build a following, sell advertising, and win influencer deals, you need to be able to produce content that can attract an audience reliably. Not just a couple of lucky strokes. If your top 3 most viewed videos make up more than 60% of your channel’s viewing, you’re dangerously close to one-hit wonder territory. On the other extreme, if you’ve made 100 videos and each video brings in 1% of your vies, you’re doing AMAZINGLY WELL. Every single thing you make is a hit. Perfection like that is unrealistic. Are you closer to a one-hit wonder or to perfection? Find yourself on the spectrum with this analysis. Note: If you’re just getting started, this analysis won’t reveal anything interesting yet. Although, it may teach you about something to look out for as your YouTube channel grows.